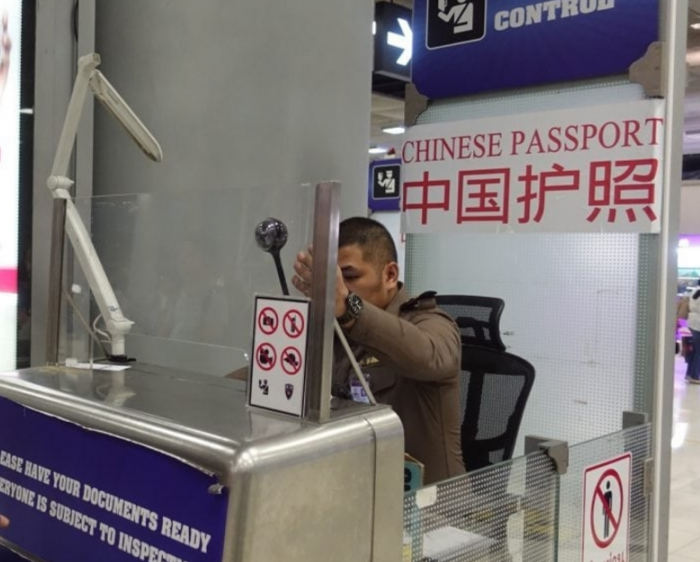 Following a few unfortunate incidents and media reports of problems with Thailand Immigration lanes where Chinese visitors got into arguments with other travelers the immigration bureau has now opened Special Lanes for Chinese Citizens. The counters which have been declared as ‘VIP Lines’ are obviously anything but – instead of privileged treatment they are designed to keep the order in the immigration area and prevent rowdy behavior. Even though officials declared this as a benefit it’s quite obvious that this hasn’t been introduced in order to actually improve treatment of arriving Chinese visitors. When arriving at Bangkok Airport the Premium/Express Lane is right next to the Visa on Arrival counters where one can witness the arrival of respective individuals first hand – it’s not a pretty picture with lots of shoving, shouting and overall aggressive behavior. The article originally appeared on Apple Daily (a Hong Kong outlet). Officials told reporters that citizens of Hong Kong as well as Taiwan are not ‘eligible’ for these lanes – they are exclusively for Chinese citizens. … According to Thai media, since the 3rd of this month, the Don Muang Airport and Suvarnabhumi Airport have added VIP channels for Chinese tourists. Among them, Suvarnabhumi Airport has opened 17 VIP channels for Chinese tourists, which is convenient for traveling to Thailand. Chinese travelers. It is reported that Chiang Mai, Hat Yai, Phuket and other airports with direct flights to China have also opened special VIP channels for Chinese tourists. I had a friend from Shanghai arriving in Bangkok the other day who reported not seeing any of these counters designated for Chinese, though the arrival was at 2am so maybe it’s a peak hour thing!? Yesterday I wrote about Chinese shoppers causing a ruckus at a Korean Duty Free Shop so there is certainly a concern for things getting out of hand. I wouldn’t expect anyone of Thai Authorities to come forward and actually declare that this is a somewhat discriminatory move. It’s like the parents telling their kids that special help classes to improve their math skills are a form of VIP treatment. Yes there was an incident with a tour boat company in Phuket (which was actually Chinese owned and operated which is quite common for tour package distributors) that caused the death of many mainland tourists a few months ago. The story has been wildly distorted in Chinese Media, especially social media channels with calls to ‘boycott Thailand as a tourist destination’ [if only…]. I highly doubt the public sentiment has cause the immigration department to take these measures. In fact it makes a lot of sense to select groups of arrivals based on their processing requirements, its more like an industrial process in the search for the most efficient (and calm) method.